After I had my VIP tour of Perth Museum, I went to look at the skulls on display on the main bit. Here are some of the best ones. All of these were from animals that you used to get in Scotland but don't anymore. 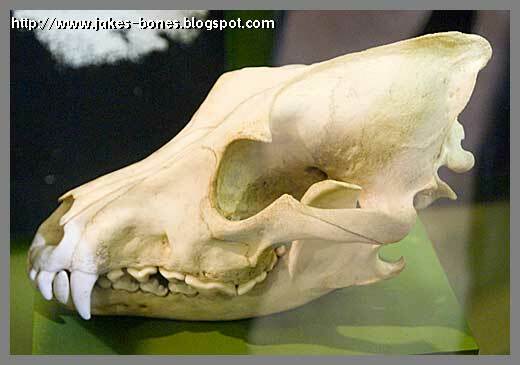 This one is a wolf skull. I saw real life wolves at the Scottish Deer Centre last year. You could see them quite close, but there were big high fences around them. I was there when they fed the wolves. They brought them raw meat and threw it in the enclosure. The wolves could smell the raw meat when it was being brought to them, even when it was a mile away. Some people want wolves to be reintroduced into the wild in Scotland. I think this is a good idea because I'd love to find a wolf skull. I would feel a bit more scared about going into a forest where I knew there were wolves, but I would still do it. 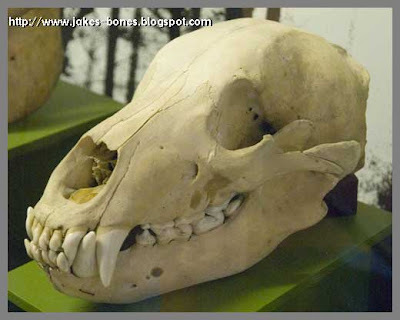 Wolf skulls look a bit like a fox or a dog skull. The thin bit on the top back of the skull is the Sagittal crest and animals that have this have strong jaws. Aurochs were big wild cows that died out in Europe about 400 years ago. 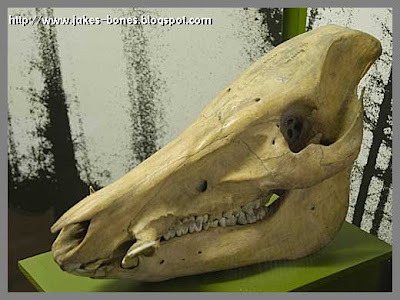 This skull was from Forfar in Scotland. 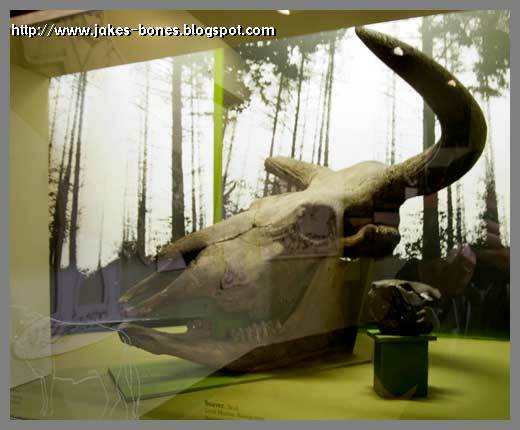 The skull looks almost the same as cows now, but aurochs were much bigger. Their shoulders were two metres off the ground, which means even if they dipped their heads they couldn't get through a normal doorframe. The other skull is from a beaver, but you can't see it properly in this picture. People are trying to reintroduce beavers into Scotland. You can read about that here. There haven't been brown bears in Scotland for ages. They died out even before the Romans got here. Only one brown bear skeleton has been found, and that was in an ancient cave in the north of Scotland. The bones were thousands of years old, and at first they thought at first it might have been a polar bear but it wasn't. There were loads of ancient bones in the same caves. Wild boar are a type of pig that used to run wild in forests in Scotland. You can still get wild boar, and about eight years ago one escaped back to into the wild near where I live. But that one was caught and shot. On the bottom jaw you can see the big tusks they have. It's a shame these animals became extinct in Scotland. It would be cool to watch them in the wild in the same way I watch roe and red deer. Here's more about my VIP visit to the museum and here's about what was in the newspaper afterwards.